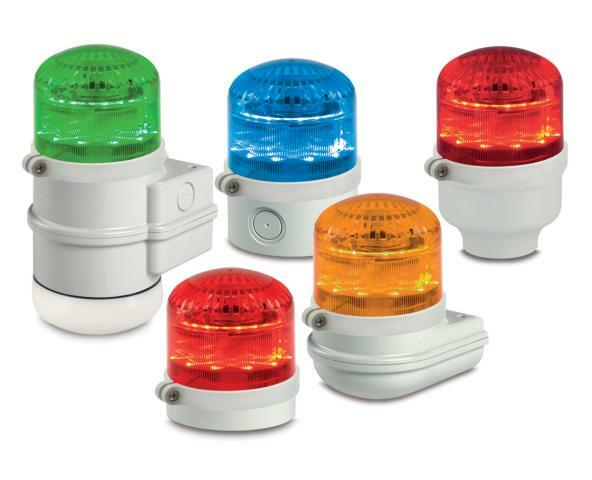 Model SLM600 is a multifunctional LED beacon and sounder combination developed with a multiple input technology that allows three separate levels of alarm (alert, pre-alarm, alarm) controllable via independent electric contacts. Channel 1 includes a simulated strobe (triple flash) visual signal only. Channel 2 adds an audible tone, selectable from 32 tones via dip switch, to the simulated strobe effect. Channel 3 includes a steady light and a second, unique tone selectable from 32 tones, for a total of 64 unique tones. The volume of a selected tone is adjustable (65dB(A)-115dB(A) for the highest performing tone). Its enclosure is made from a self-extinguishing polycarbonate material with high impact and UV resistance.